Here is a link to my new telephoto shots of the areas with the most extensive damage on the walls of the Gorge as well as a shot of landslide area as seen from WA. Just scroll and click thumbnails to get to images and to see blow ups of each photo. Yesterday I had to drive to PDX so I missed the very strong Hatch winds. But I dropped by the Hatch mid day to check out the wind just as the 10+ day fire went crazy just west of Stevenson. At the same time fireworks started a small fire near Hood River. From the Hatch I could see helicopters dumping water on the far western outskirts of Hood River. 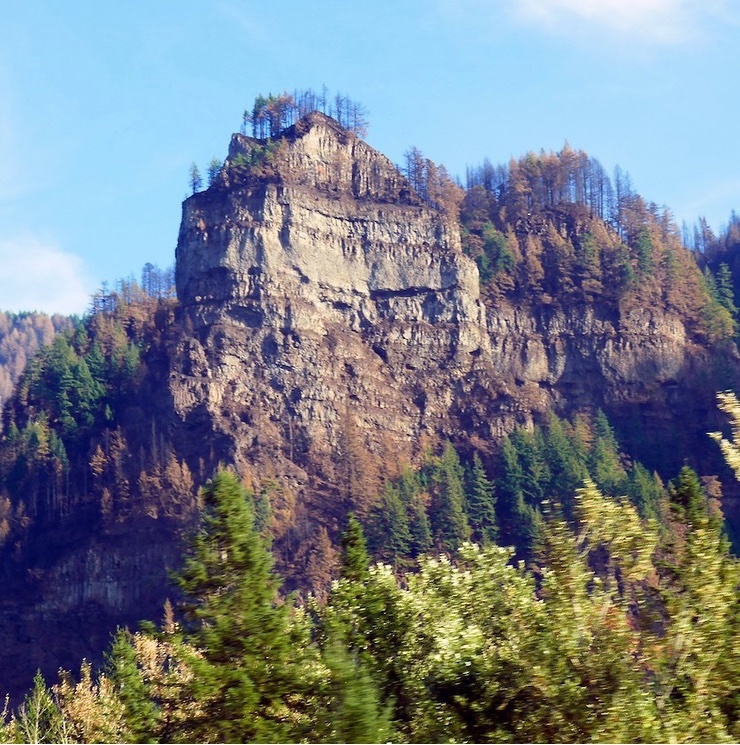 So as I drove to PDX I took a series of photos of the fire spreading along our beloved Gorge. Today's Fire map via a link sent by Mike B. The latest maps have the eastern edge of the fire just north of Mount Defiance. We could see the fire last night from White Salmon. Below is a close up of the latest fire map image. I have marked some familiar landmarks for you like Viento and the Hood River Golf Course. The GREEN diamond show the the peak of Mt. Defiance which is just across the river to the west of Hatch and Swell. If the fire goes up the slope of 4957 foot Mt. Defiance burning embers will throw a great distance. Have water hose ready for embers if you are within a few miles of Mt. Defiance. Sunday night, Insitu launched its ScanEagle unmanned aircraft from Bingen Point into a gloomy, smoke-filled sky. 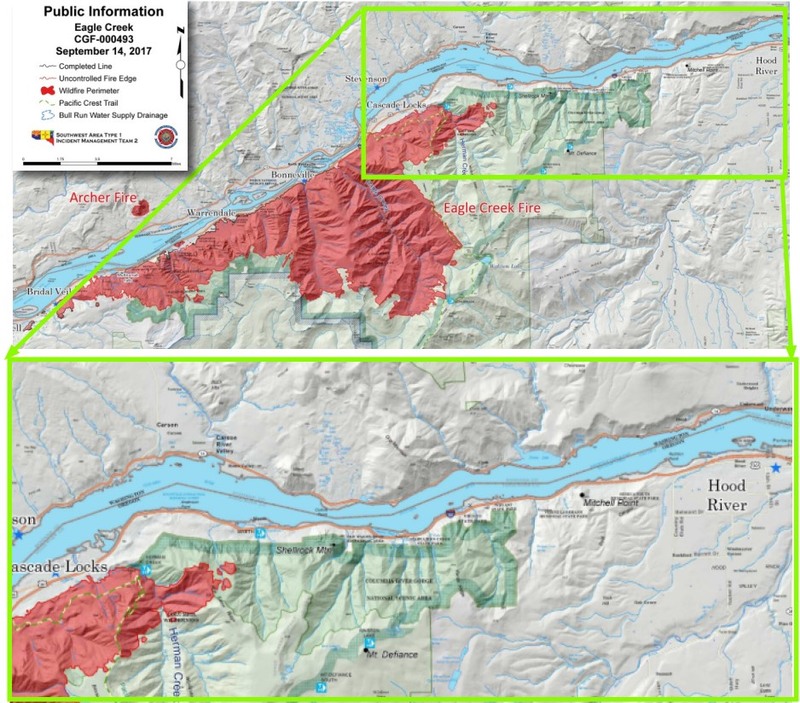 #The flight, which ran into the late morning hours, provided emergency responders on the ground with infrared aerial imagery in support of their efforts to control and contain the Eagle Creek Fire. These photo were taken last night about 8PM. 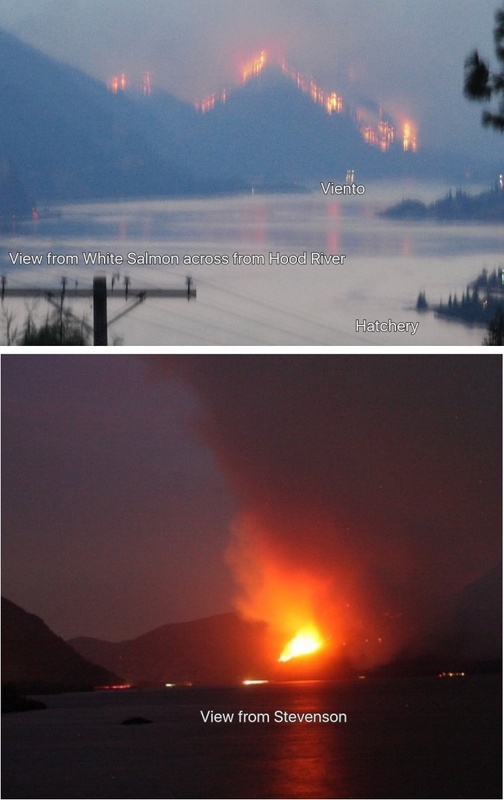 The top one is from my place looking west past the Hatchery towards Stevenson. Long exposure hand held so shaky. Trees were exploding every minute or so. The second is from the Stevenson Cam. I drove on Hay. 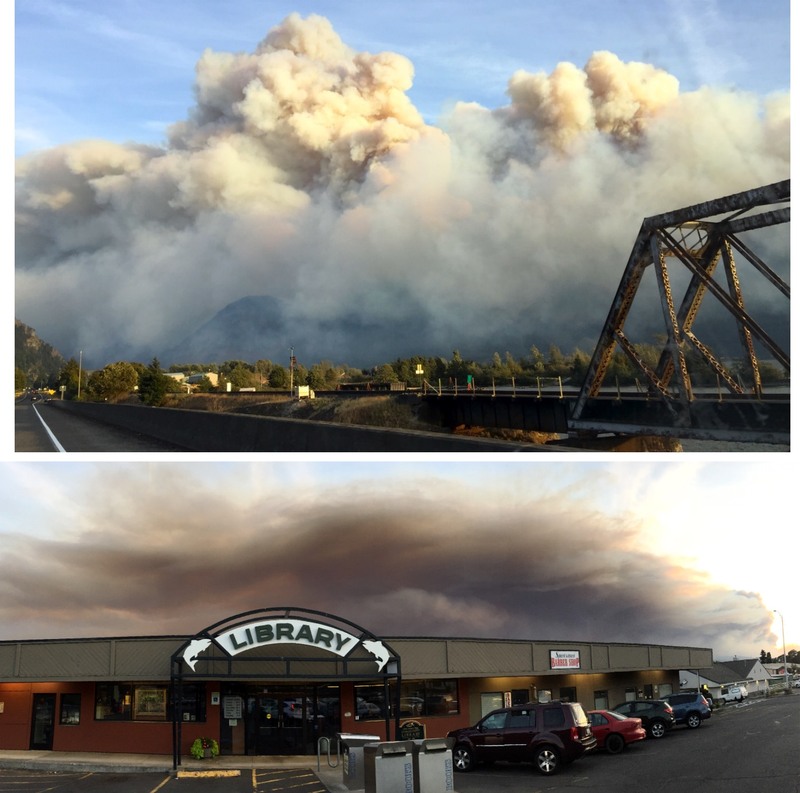 84 yesterday from Hood River to Cascade Locks to talk to locals about the fire. I will have photos and summary later today. Yesterday I drove from Hood River to Cascade Locks on Hay. 84 to talk to locals. It was a relief to find almost no sign of fire damage from the river to the lower slopes of the Gorge in this zone. Smoke obscured the walls of the Gorge but later from Hay. 14 it appears that the damage on the Gorge walls is patchy. I would expect more signs of fire damage west of Cascade Locks. Cascade Locks local businesses are really hurting after almost 2 weeks with few customers. Despite this locals are feeding many of the almost 1000 fire fighters. There are huge signs everywhere thanking the fire fighters. See below. 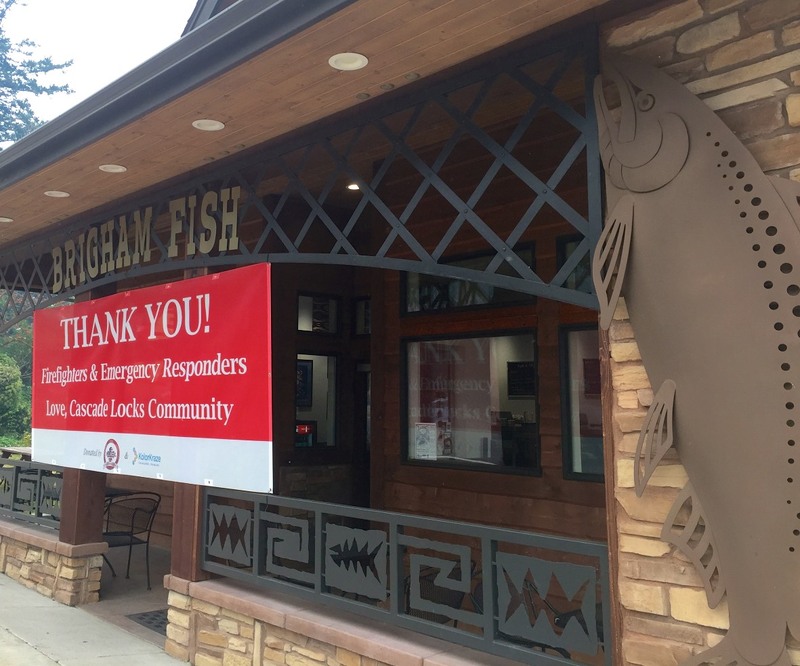 I talked to the owner of Brigham Fish and she said they have had no deliveries of fish since the fire started and they fed firefighters until they depleted their supplies. When you are in the area make it a point to patronize the businesses of these brave Cascade Locks folks that have borne the brunt of the Gorge fire. Incidentally if you have not been to Brigham Fish for lunch I highly recommend it. Classy large selection seafood market & restaurant. What they call Fish & Chips is actually 2 large thick filets of Halibut, non greasy and lightly breaded + fries + decent coleslaw. Best seafood eating I have found in the Gorge! Smoke was thick, but the fire was patchy in the hills. Very surprised at how many places it burned right up to the highway and/or jumped the divider. It didn't burn everything- lots of trees are left - but I was shocked to see that everything right up to the waterfall and the lodge at Multanomah was just ash. Crews have been insanely busy cutting down dead trees - stumps everywhere. None of the exits are open until you get to Troutdale.